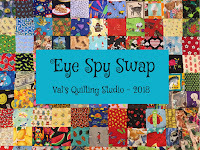 Val's Quilting Studio : "Eye-Spy" Swap is Coming! Yes! Buried in eye-spy squares as I sew to finish my May OMG and get it on the quilting frame. 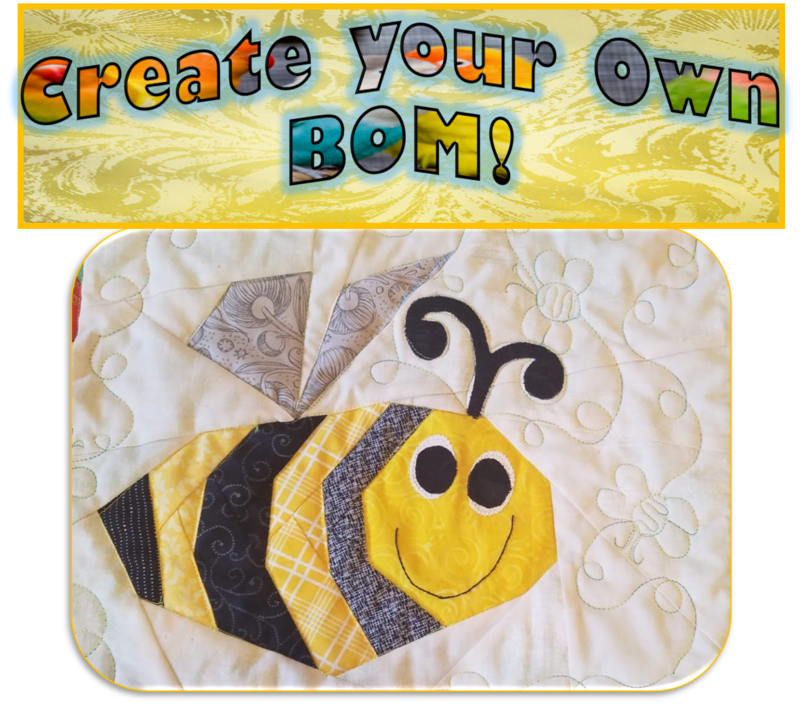 You will need ten different fabrics with recognizable prints within a 3 1/2" square. Below are examples of blocks I threw away. Once these are sewn together the objects are almost unrecognizable for a small person to tell you what they are looking at. 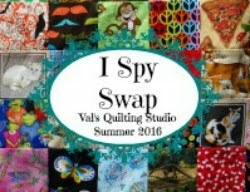 I hope today's post helps as you begin to select fun eye-spy fabrics for the swap. Mark you calendar to stop by this Friday, June 1st, for swap details and sign-up information. It's going to be a fun swap with great Happy Mail for us all to look forward to! PS: Help me spread the word! Add this button below to your blogs and posts. This will be a double swap...meaning with a maximum of 36 "swap spots" available, you'll be able to sign-up for a maximum of two regular swap spots if you want...but the fabrics for each swap will need to be different. Okay...Happy collecting!! I hope you'll think about joining us. 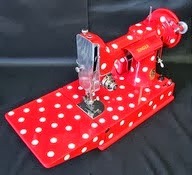 I hope you have a great time sewing today! I'd like to play, too. 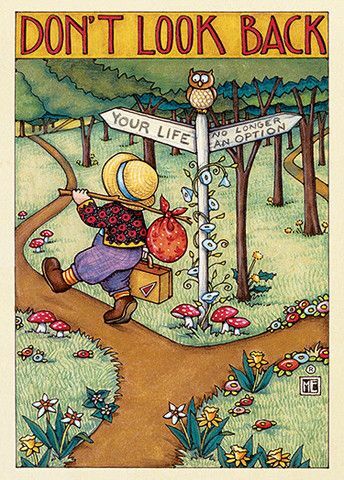 Can I send you an email with a few questions before committing? Yay! So excited for another swap! I'll look through my supply and see what I've got! I love what you are working on and I "spy" a few I submitted last time! (I was relieved not to see any of mine in the thrown away examples!) I hope the end of the school year is treating you well and I look forward to Friday! Your Eye Spy quilt top is looking fabulous, lovely Val. The swap sounds like a lot of fun. I hope I can participate.